1st we have the Athena Bookcase Set. This is updated and expanded from the Storybook Hunt gift. I loved it so much Ke decided to sell it in store. 3. athena rug, 1 prim, copy / mod - texture, tint, brightness, shininess and glow changeable in 1 group. Next we have the Boreas Bench Set. Find it at Xstreet also - here. All our items can also be bought individually at our Main Store in world. A nice match with the Boreas is the Demeter Plants and Palms. As low prim converts we find people asking more and more for us to supply them with low prim plants to enhance their gardens. Demeter is our answer. 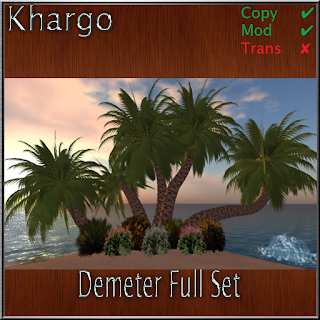 Besides the Full Set we also sell the Demeter Palms and Plants or you can buy them all individually at our Main Store.